Your reserved ticket will be at the door. Partake in savory food, delectable drinks, amusing games, best hat contest, and door prizes. Watch the exciting Kentucky Derby with your friends and neighbors. Maybe you’ll even be a winner!!! Live music by Kevin Ellis, Catered by Golden Pair. 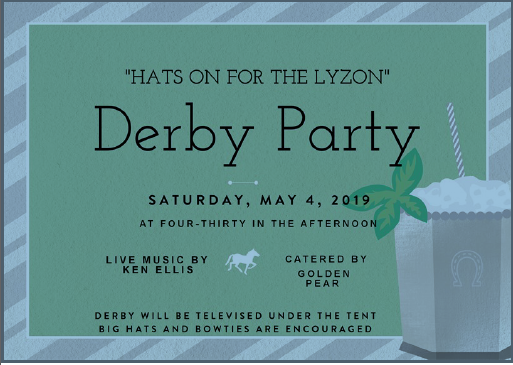 Derby will be televised under the tent. Big Hats and Bow Ties are encouraged! !